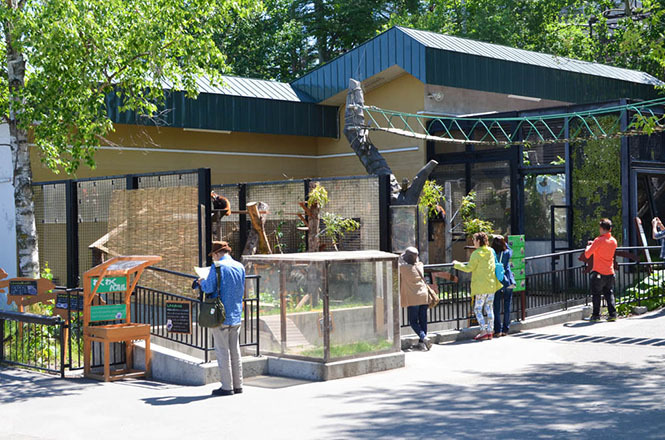 Asahiyama Zoo (旭山動物園物語) is a zoo in the eastern part of Asahikawa city, and is well-known as the northernmost zoo in Japan, and has the 4th largest visitors after Ueno Zoo (上野動物園), Higashiyama Zoo (東山動物園) and Tenoji Zoo (天王寺動物園) in the Japan, and about 1,400,000 people visit here. A lot of tourists come from oversea countries such as Hong Kong and Taiwan as well as all over the Japan, too. 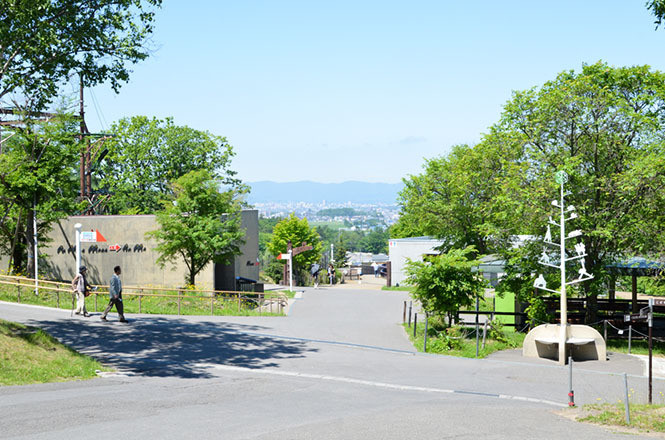 The Asahiyama Zoo originally used to be a loss-making zoo, but they changed ways of exhibitions. 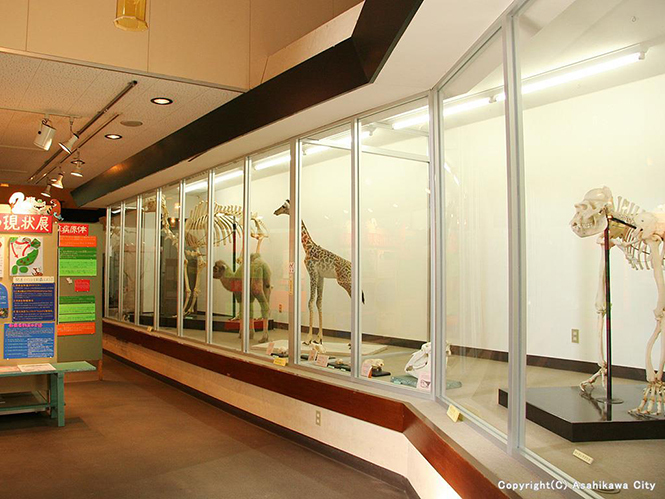 One is "Action exhibitions to show original wild life of animals", and other is "Mixed exhibitions to let animals of different types coexist in a near‐natural environment". 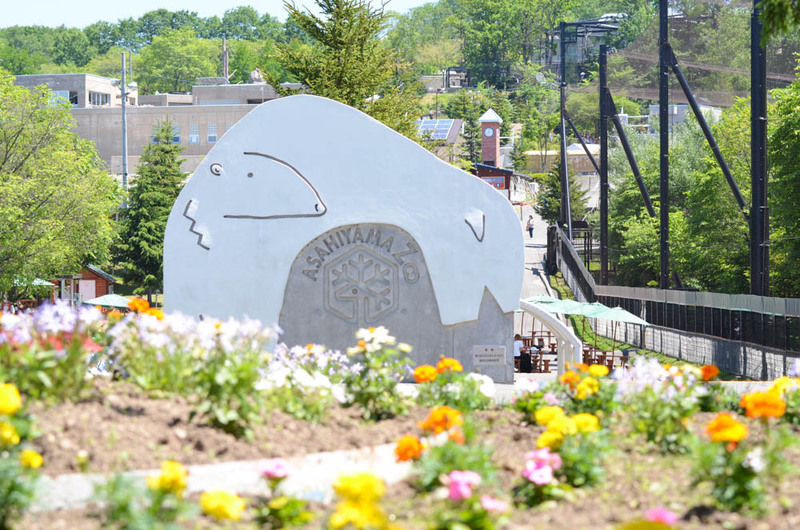 "Asahiyama Zoo Story -Penguins fly in the sky- (旭山動物園物語　ペンギンが空を飛ぶ)" was broadcasted on a movie and a tv, and the Asahiyama Zoo became one of the most popular tourist attractions in Hokkaido. About 150 types of 750 animals are bred at present. 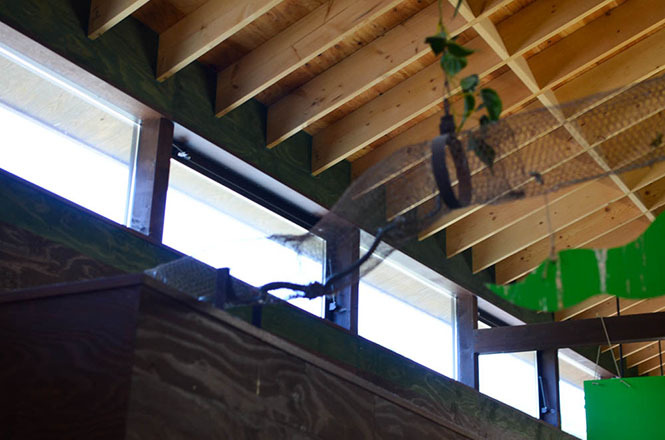 More than 20 animal house facilities are built at the site. As for animals living only in the Hokkaido, Blakiston's Fish-owl, Yezo Raccoon Dog, North Fox, Yezo Deer, Great Spotted Woodpecker are bred. 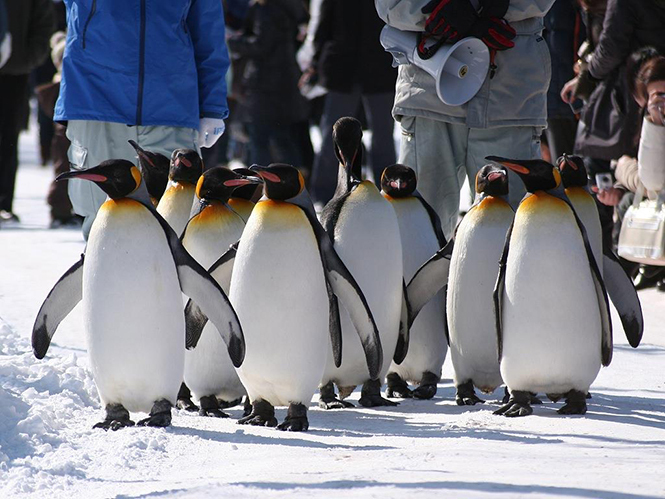 A feeding for animals is called "Mogumogu Time (モグモグタイム)" and winter season-limited penguin walkg are one of the most popular events in the Asahiyama Zoo. Tourists often form a queue about for 30 minutes early before opeing the feeding. 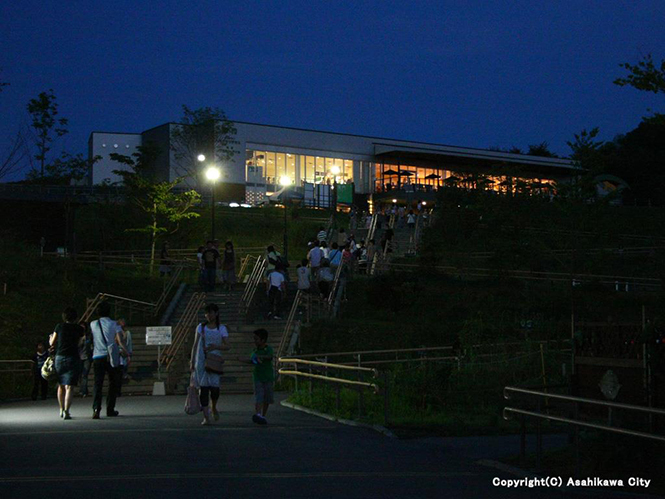 In mid August, night zoo is held, too. It takes about 3 hours to go a round. By the way, A free parking lot is provided. However, an attention is necessary because it is invited by a toll parking lot. Strollers and wheelchairs are provided for free, too. 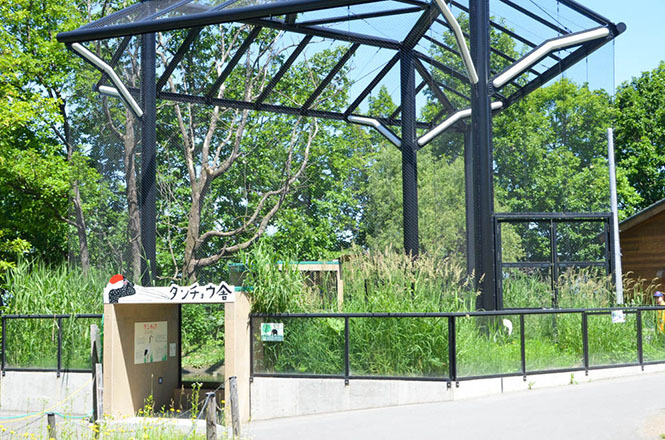 Animal houses at the Asahiyama Zoo are as follows. 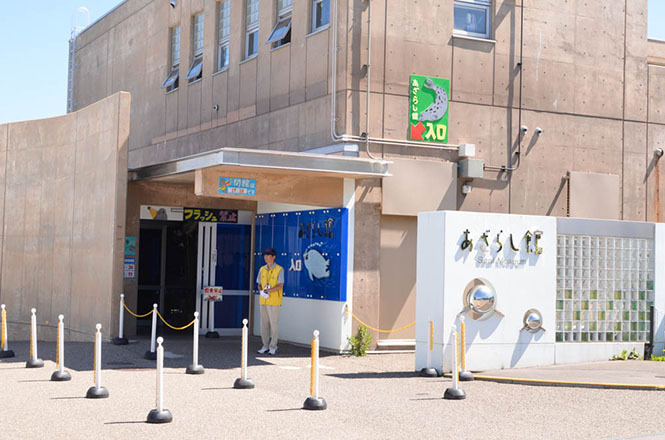 There are Polar Bear House (ほっきょくぐま館), Seal House (あざらし館), Penguin House (ぺんぎん館), Orangutang House (オランウータン舎・おらんうーたん館), Spider Monkey and Capybara House (くもざる・かぴばら館), Monkey Mountain (さる山), Ape House (サル舎), Children Pasture (こども牧場), Gibbon House (てながざる館), Blue Fox House (ホッキョクギツネ舎), Lesser Panda House (レッサーパンダ舎), Small Animal House (小獣舎), Totori Village (ととりの村), Flamingo House (フラミンゴ舎), Forest of Yezo Deer (エゾシカの森), Forest of Wolf (オオカミの森), Hokkaido Animal House (北海道産動物舎), Eagle and Hawk House House (シマフクロウ舎), Red-crowned Crane House (タンチョウ舎), Amphibia and Reptile House (両生類・は虫類舎), Forest of Chimpanzee and Chimpanzee House (チンパンジーの森・ちんぱんじー館), Reindeer House (トナカイ舎), Eagle and Hawk House (ワシ・タカ舎), Giraffe House (きりん舎), Hippopotamus House (かば館), Peacock House (クジャク舎) and Animal Material Pavilion and Animal Library (動物資料展示館・動物図書館). 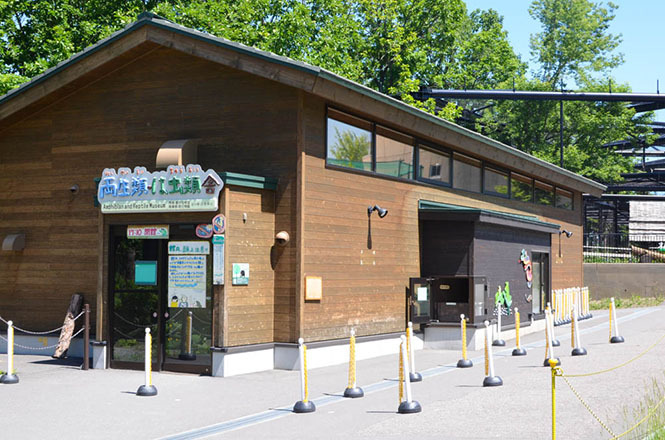 Atmosphere of Ahahiyama Zoo Can Be Watched on Youtube. 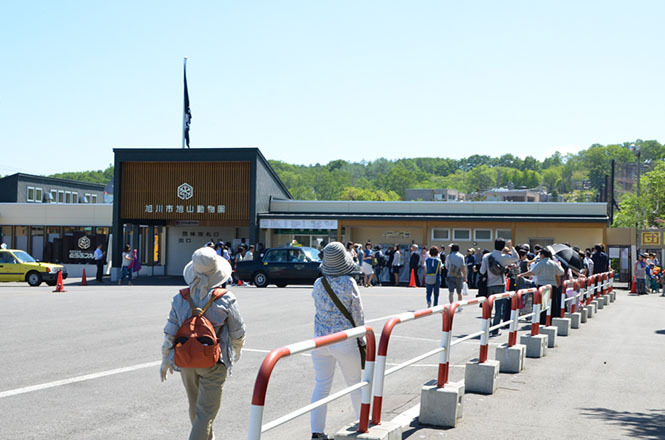 A direct bus does not run between Sapporo or New Chitose Airport and the Ahahiyama Zoo. 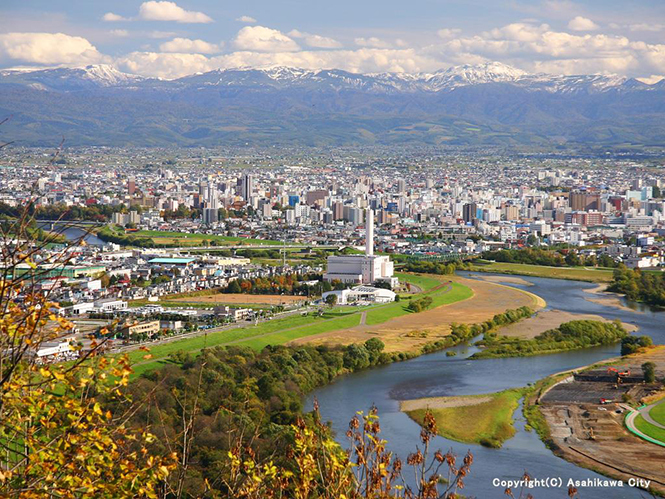 But High Speed Asahikawa-go (高速あさひかわ号) and Express Nayoro-go (高速なよろ号), express buses, runs between the Asahikawa and the Sapporo, and Taisetsu Liner (たいせつライナー), an express bus, runs between the Asahikawa and the New Chitose Airport, and Sunrise Asahikawa-Kushiro-go (サンライズ旭川・釧路号), an express bus, runs between the Asahikawa and Kushiro, and Limited Express Sekihoku-go (特急石北号), an express bus, runs between the Kitami and Asahikawa, and "North Liner-go (ノースライナー号)", an express bus, runs between the Asahikawa and Obihiro. 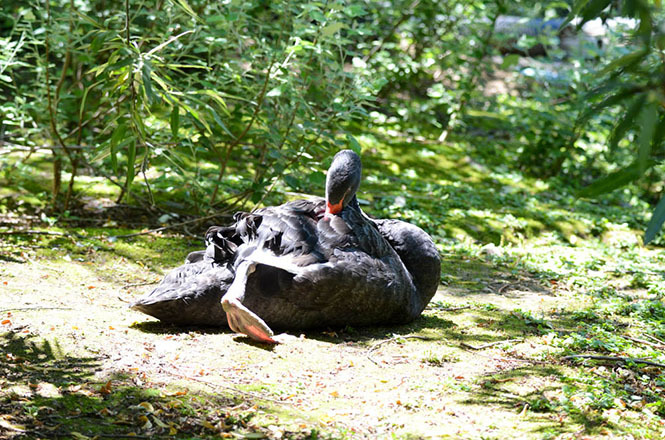 Wild birds such as Swan, Wild Goose and Duck are pastured at gauges of the Totori village (ととりの村). I am glad that I can observe the wild birds without shutting out on wire nettings. Flamingos are bred at the Flamingo House. 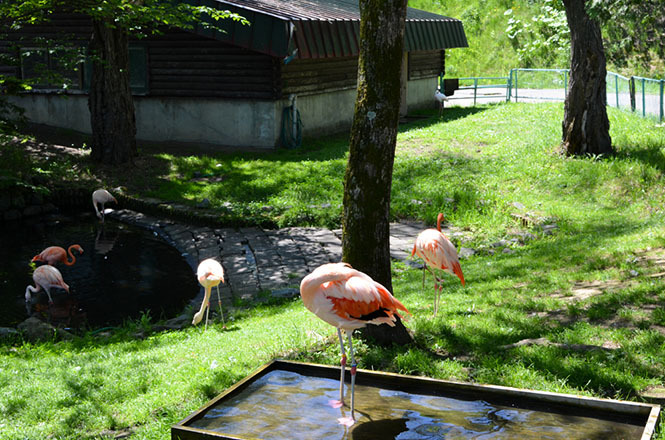 3 types of flamingos, American Flamingo, European Flamingo and Chilean Flamingo are bred. 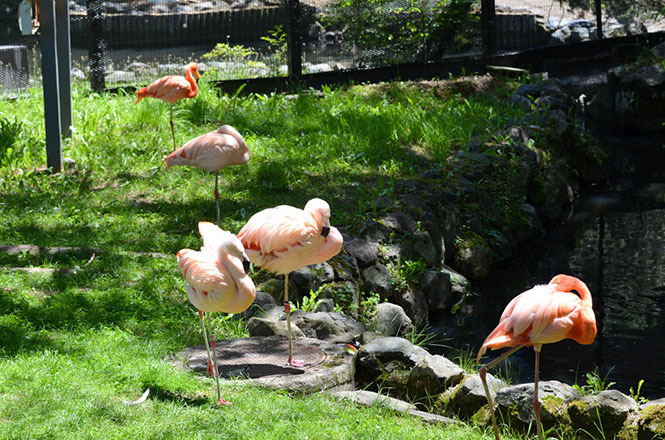 Originally, the flamingos standing by a foot inhabit the West Asia, the Africa, the South America. 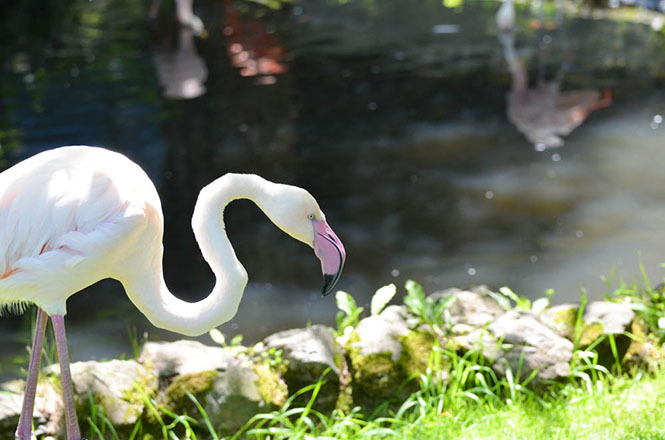 The Chilean Flamingo is in danger of dying out. 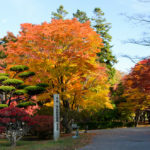 Atmosphere of Totori Village and Flamingo House Can Be Watched on Youtube. 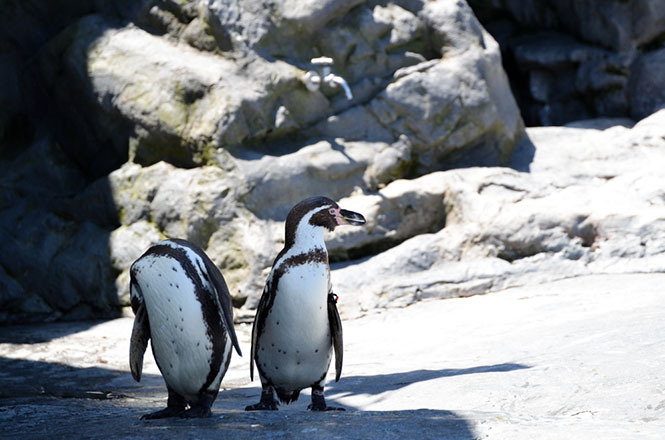 4 types of penguins, King Penguin, Rockhopper Penguin, Humboldt Penguin and Gentoo Penguin are bred at the Penguin House. 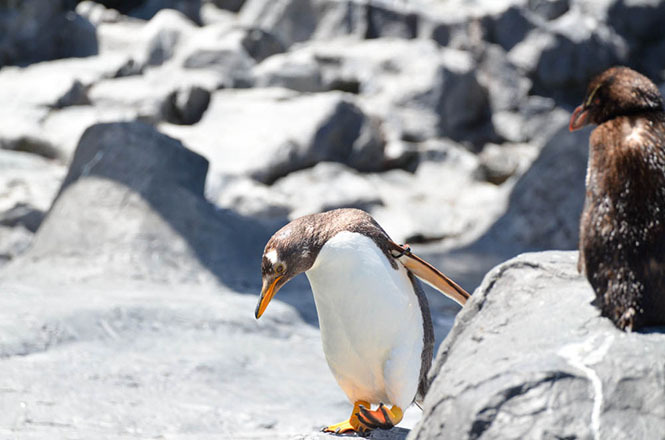 It is a facility to observe penguin habits of water, land and feedings are seen in the water and on the land. 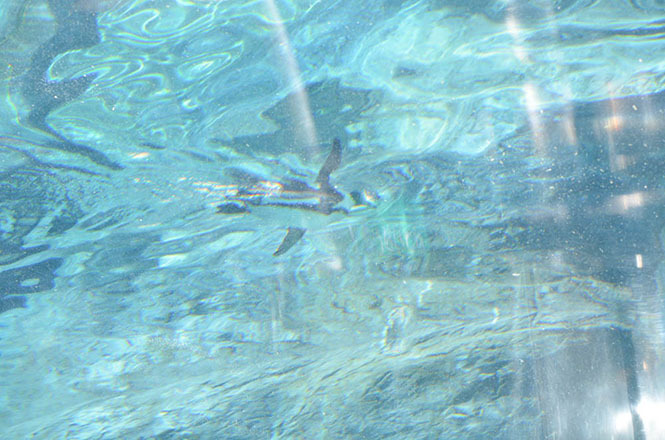 In addition, they are like flying in the sky if visitors watch swimming penguins from an underwater tunnel. 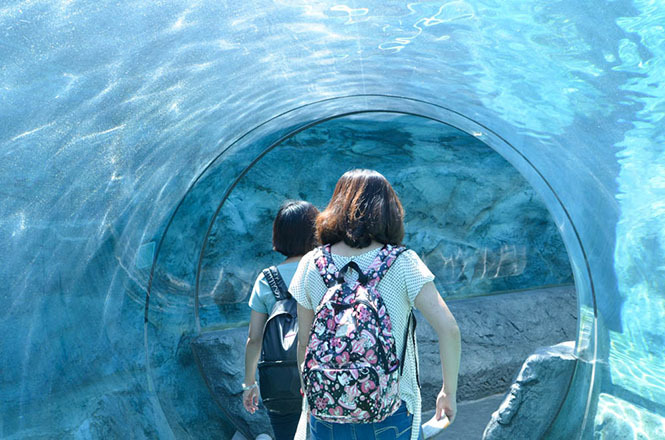 It is well-known as a popular event of the Asahiyama Zoo. I never would have guessed that I could observe actions of the penguins from top and bottom, right and left. 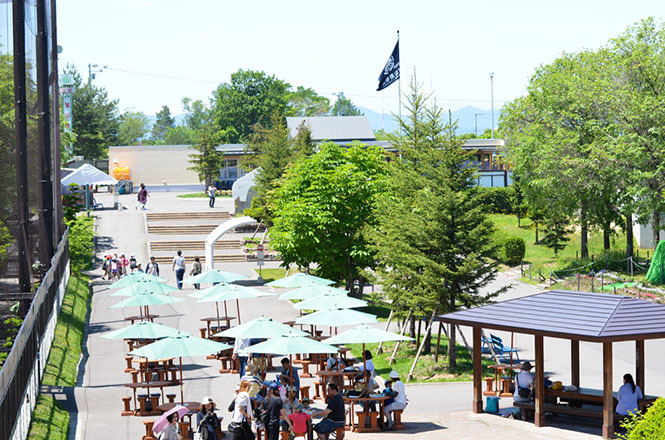 Atmosphere of Penguin House Can Be Watched on Youtube. Amur Tiger, Lion, Yezo Brown Bear, Black Leopard, Amur Leopard, Snow Leopard are bred at the Fierce Animal House. Those are cat families other than the Yezo Brown Bear, and are in danger of extinction. 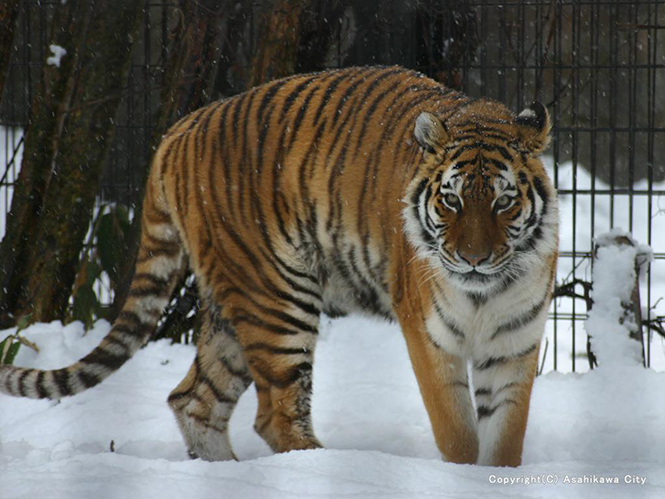 As for the Amur Tiger, there is 1 female. Her name is Non (ノン). Originally, they inhabit along Amur Basin. An individual seems to live for 25 years. As for the Lion, there are 1 male and 1 female. His name is Lila (ライラ), and her name is Leira (レイラ). Originally, they inhabit the African Continent. Though they are cat families, it is a rare kind that they live in groups. A cat acts almost alone, for sure. The Yezo Brown Bear is 1 female. Her name is Tonko (とんこ). Originally, they inhabit the Hokkaido, and are the largest mammals in the Japan. A large individual seems to be length over 3.5 m. An individual seems to live for 40 years. The Black Leopard is 1 male. His name is Pakkun (パックン). Originally, they inhabit the Eurasian Continent and the Africa Continent. Hairs of the Leopard turn into black hair by mutation. It is not a kind that named the Black Leopard. 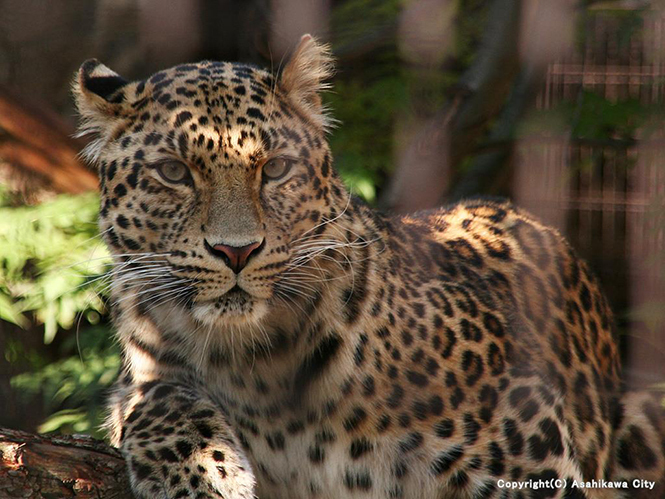 The Amur Leopard are 2 males. Their names are Kin (キン) and Athen (アテネ). Originally, they inhabit along the Amur Basin. The Snow Leopard are 1 male and 1 female. His name is Yamato (ヤマト), and her name is Zima (ジーマ). Originally, they inhabit aound the Himalayas. An individual seems to live for 21 years. Atmosphere of Fierce Animal House Can Be Watched on Youtube. 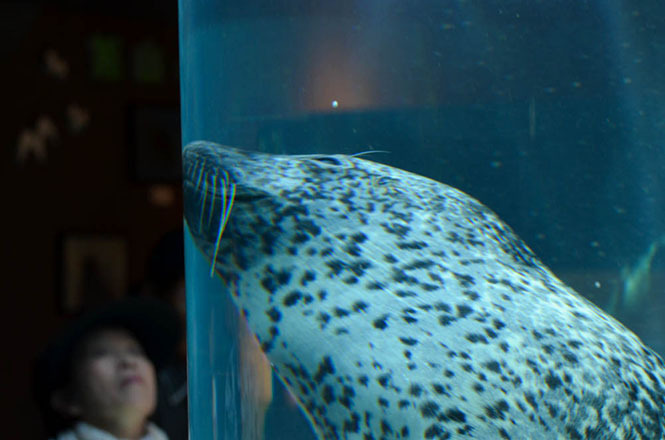 Harbor Seal House reproduces a fishing port in the Hokkaido, and is a facility to observe harbor seals from water and land. It is a highlight that they in particular swim a marine way (cylindrical glass water tank). 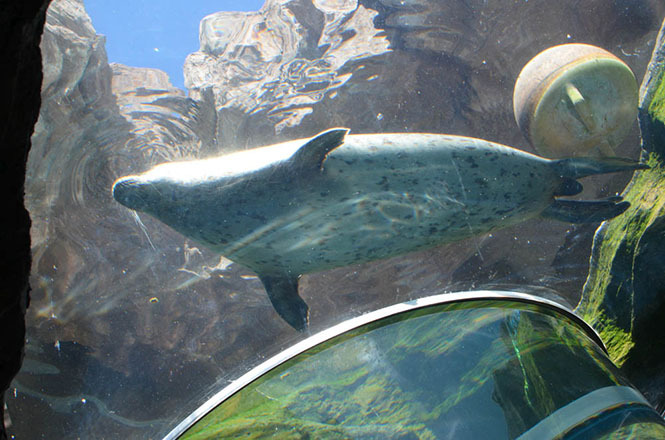 Visitors can watch the harbor seals from top, bottom, right and left. 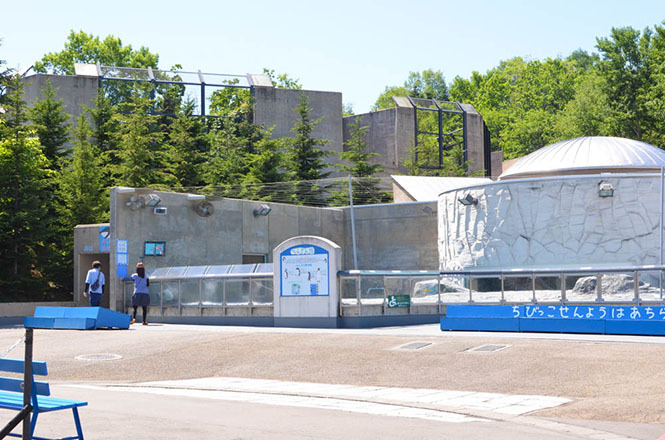 In addition, White-tailed Sea Eagle and Black-tailed Gull are displayed on the shore. However, they do not get away because they can not fly by broken wings. I feel sorry for them. 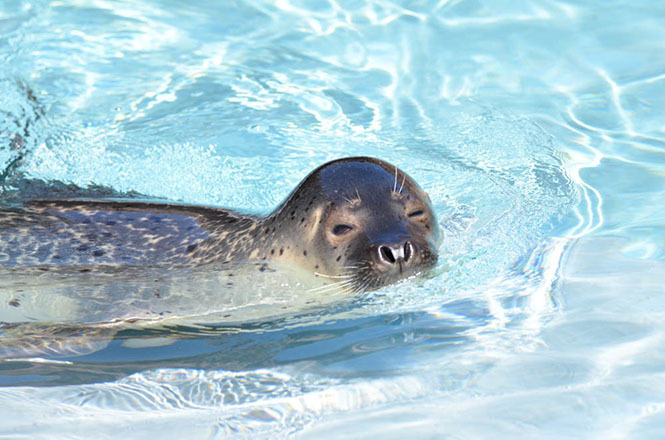 When I look up, Harbor Seal Appear! 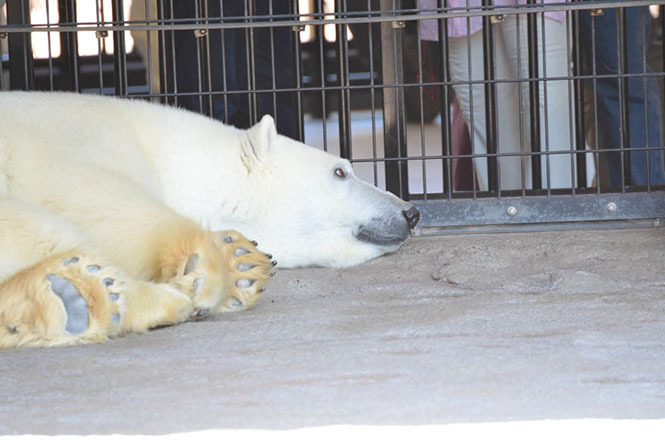 4 Polar Bears are bred at the Polar Bear House (ほっきょくぐま館). His name is Ivan (イワン), and hers names are Satsuki (サツキ), Pilica (ピリカ) and Lulu (ルル). 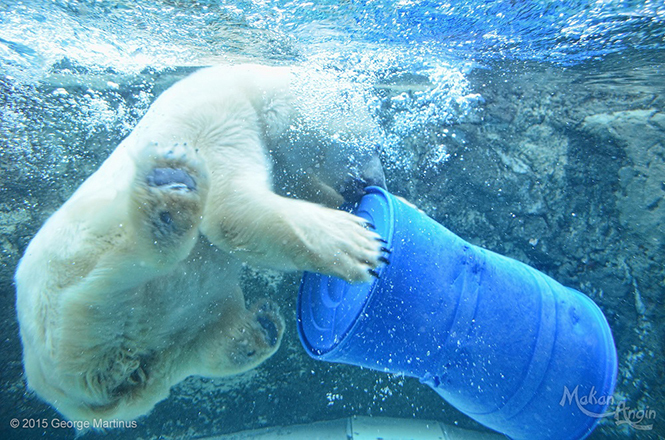 This is a facility to observe the polar bears in water and on land. There is an observation stand called Shield Eye on the land. 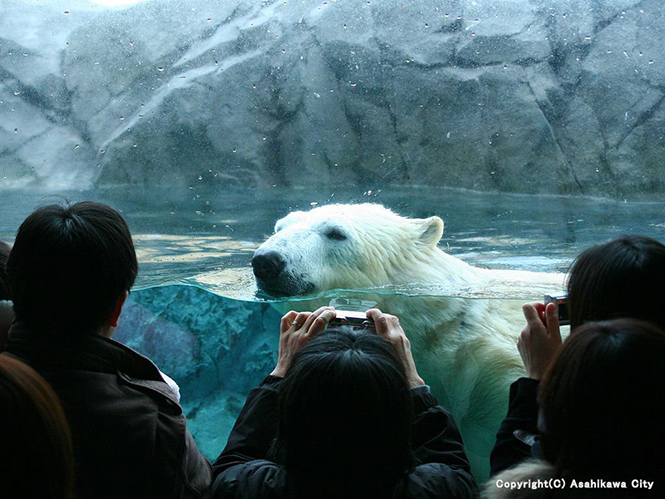 Visitors can watch the polar bears from views of harbor seals. * The harbor seals are hunted and eaten by the polar bears. You are very lucky if you see their powerful water dive. Originally, they inhabit the Arctic. 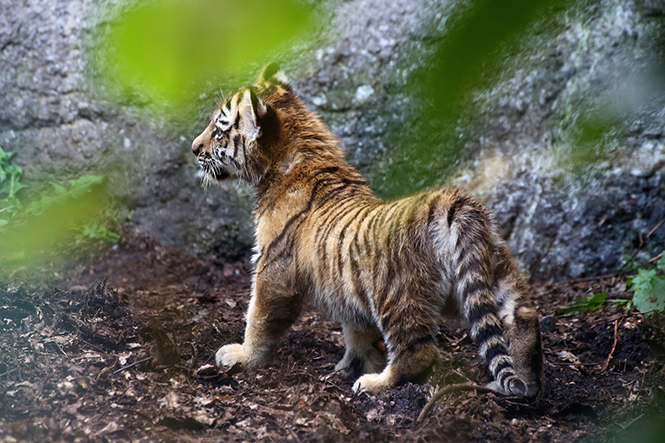 An individual seems to live for 40 years, and are in danger of extinction. By the way, Makan Angin reporting about travels in Indonesia provided photos. 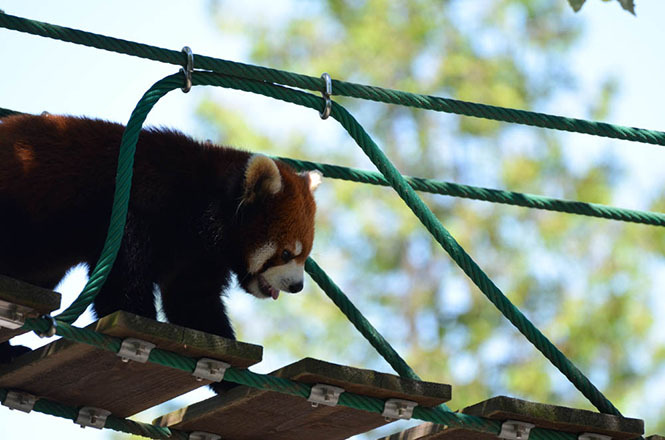 5 Lesser Panda and 1 Blue Fox are bred at the Lesser Panda House and Blue Fox House. 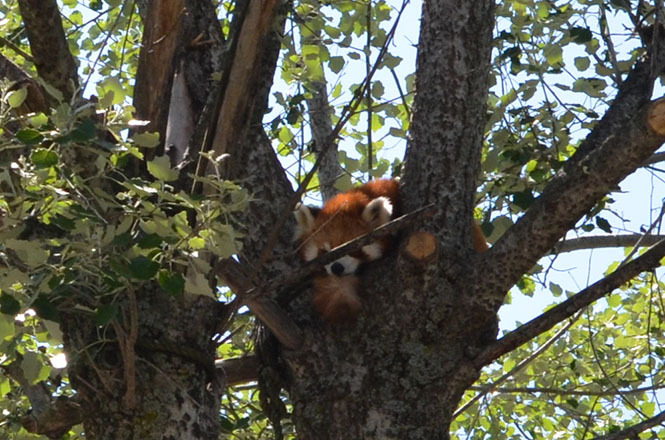 The Lesser Panda is a racoon family, and is in danger of extinction. Originally, they inhabit the Chinese highlands. Their homes are on the tree. 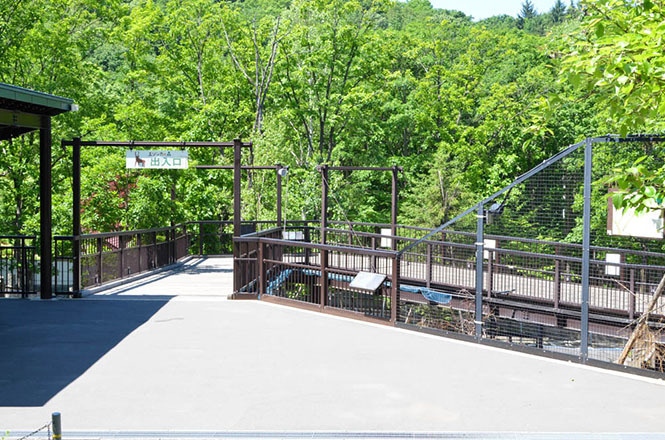 Therefore a popular suspension bridge was built because they were good at climbing trees. 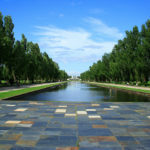 Visitors can observe the state from the bottom. In addition, Originally, the Blue Fox inhabit the Arctic, and is covered with black hair in a summer, the black hair turns into white hiar in a winter. I am surprised in different appearance. As for the blue fox, unfortunately, 1 female and 7 children seem to have died. 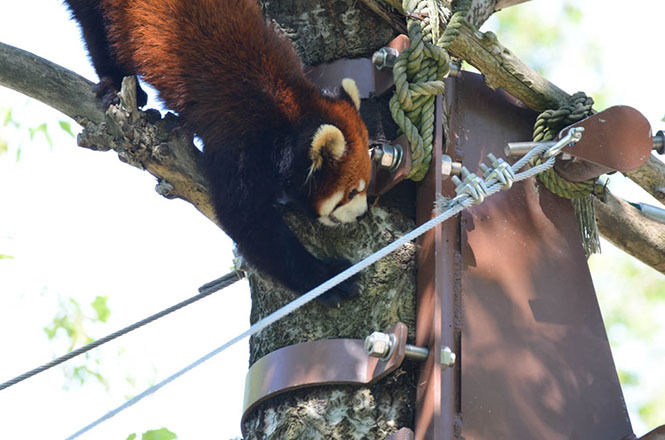 Atmosphere of Lesser Panda House and Blue Fox House Can Be Watched on Youtube. Clouded Leopard, Raccoon, African Mane Porcupine are bred at the Small Animal House. The Clouded Leopard is a cat family, and originally, inhabits the Southeast Asia highlands, and is in danger of extinction. They may eat a deer for carnivore. Originally, the Raccoon inhabits the North America. They seem to eat anything for omnivores. Rascal is famous. 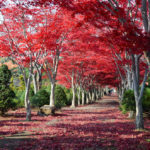 However, in late years, they are designated as an invasive alien species in the Japan. Originally, the African Mane Porcupine inhabits the North Africa. An individual seems to live for 20 years. In fact, they are good swimmer. The length of their needles is about 50 cm, and they may give a foreign enemy a fatal injury. How dreadful ! Atmosphere of Clouded Leopard Can Be Watched on Youtube. 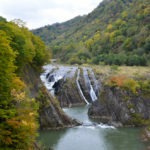 Forest of Wolf is made from a forest, stones, rocks and a river in order to reproduce 100 years ago-Hokkaido. 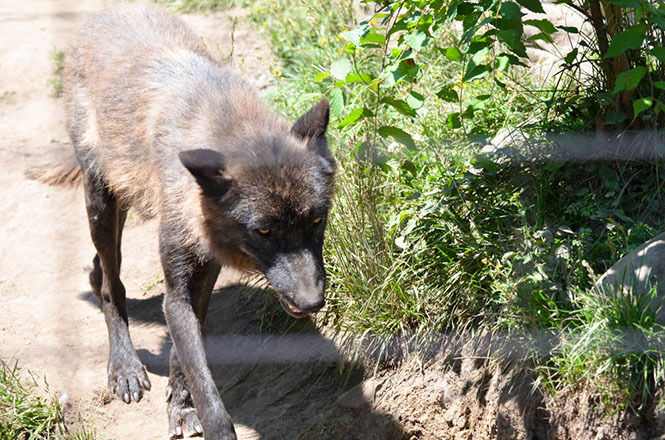 It is a facility to observe wolves from top, bottom, right and left. Yezo Deer that is game is displayed beside the Forest of Wolf. * It does not really become baits. 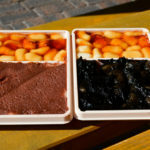 Male are Ken (ケン) and Nupuri (ヌプリ). Female are Maas (マース), Lera (レラ), Kant (カント), Nonno (ノンノ), Wakka (ワッカ) and Mina (ミナ). As well as nature, they live in groups with blood relationship. 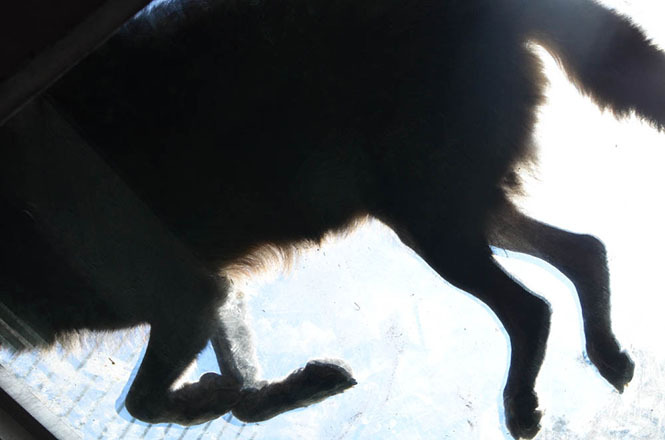 The lobo is a dog family, and is the maximum size in the dog family. An individual seems to be length over 150 cm. 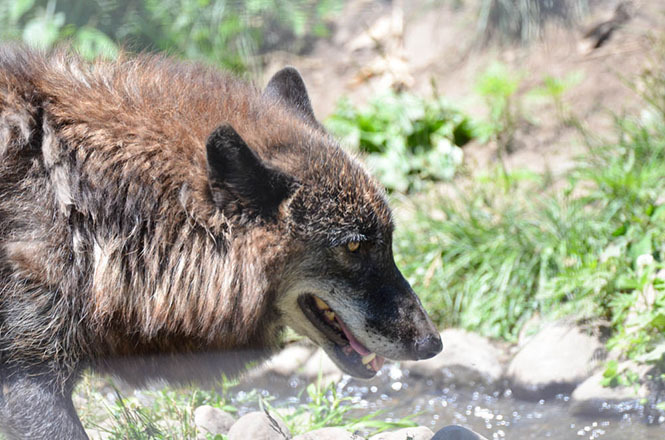 Originally, the lobo inhabits the North America. 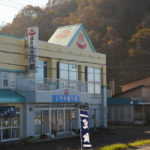 Will there be connected with revival of Yezo Wolf (エゾオオカミ) that used to inhabit the Hokkaido? Atmosphere of Forest of Wolf Can Be Watched on Youtube. Yezo Deer is bred at the Forest of Yezo Deer. 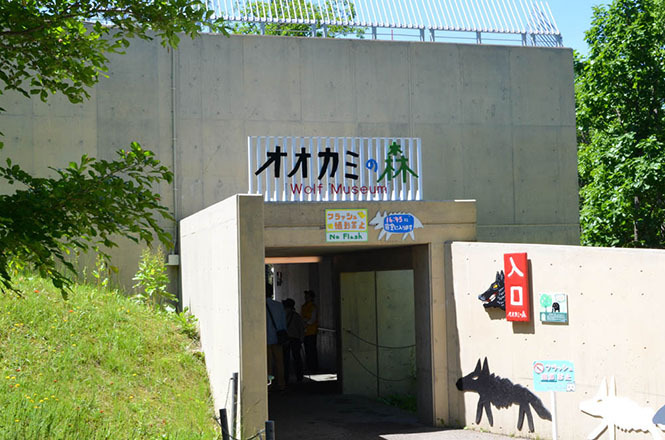 It is a pair facility toward the Forest of Wolf. 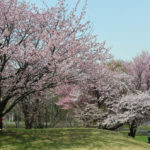 Originally, they inhabit the Hokkaido. An individual seems to live for 25 years. 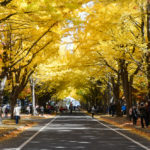 Atmosphere of Forest of Yezo Deer Can Be Watched on Youtube. 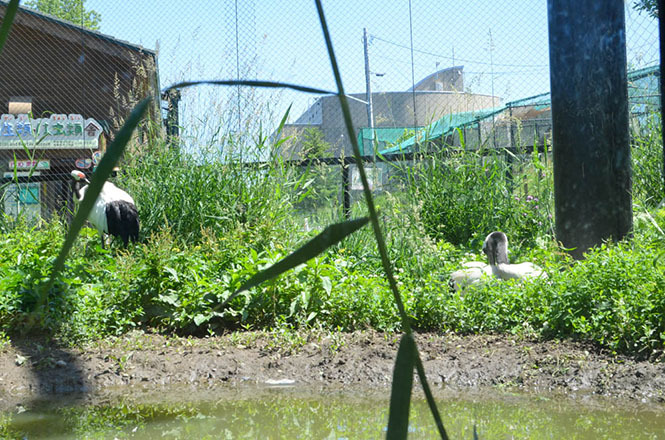 3 Japanese Cranes are bred at the Red-crowned Crane House. His male is Tansei (丹星), and her name is Nomoko (ノモ子), and they have a chick. 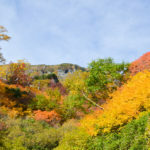 Originally, they inhabit the Northeastern Part of Asia and the Hokkaido, and are in danger of the extinction, and have been designated as a natural monument in the Japan. 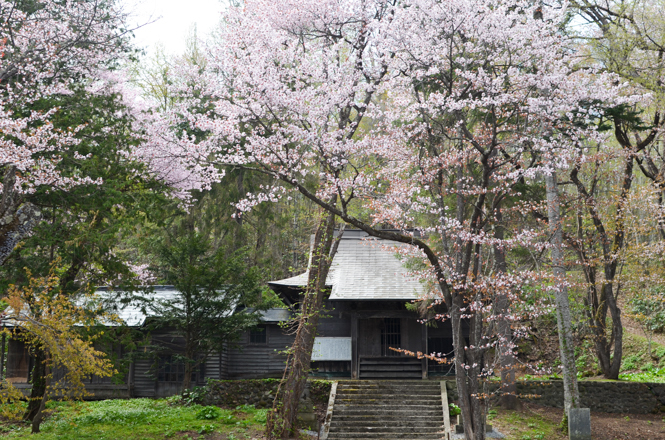 Atmosphere of Red-crowned Crane House Can Be Watched on Youtube. Elaphe Climacophora, Hokkaido Frog, American Alligator, Turtle are bred at the Amphibians and Reptiles House. Originally, the Elaphe Climacophora inhabits the Japan, and is the largest snake with about 2 m in total length in the Japan. An individual seems to live for 15 years. The Hokkaido Frog inhabits the Hokkaido, and an individual seems to live for 10 years. Originally, the American Alligator inhabits along a basin of Mississippi in the North America Southeast. An individual seems to be length over 6 m. They are the largest alligator in the alligators. An individual seems to live for 70 years. 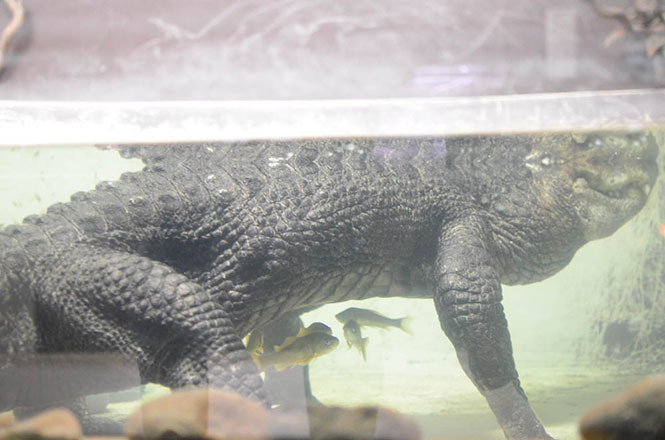 This crocodile has no name, but she has been bred since opening of the zoo. 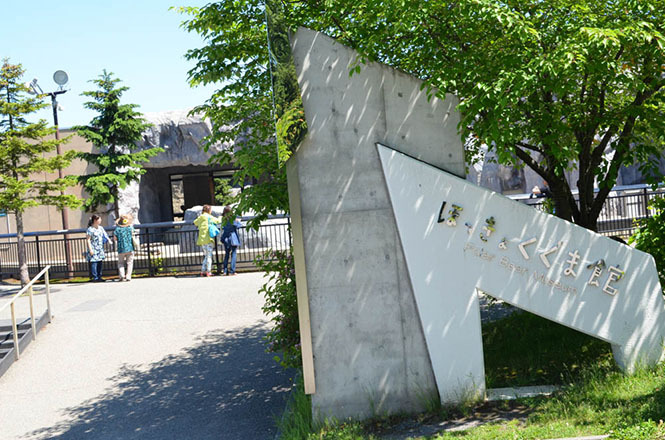 It is an existence of the knowledgeable animal in the Asahiyama Zoo. Atmosphere of Amphibians and Reptiles House Can Be Watched on Youtube. Unfortunately I do not have the zoo. But I found about wheelchair on the internet. Please ask a staff at a gate. 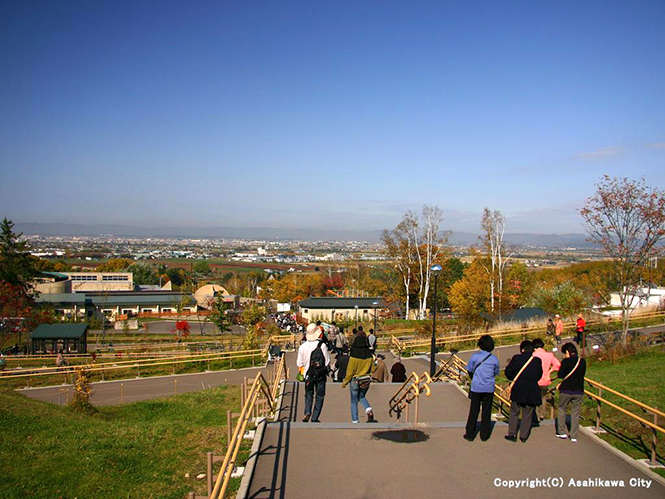 In addition, a pamphleta brochure of Asahiyama Zoo in English. Wheelchair for rent or not?